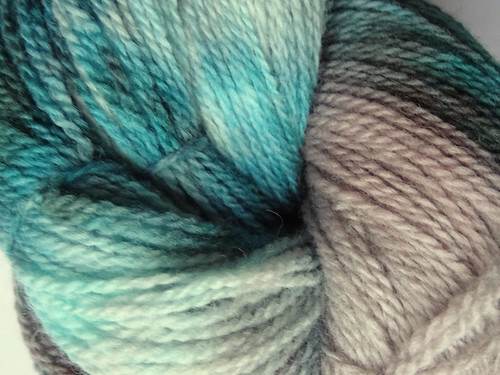 I have been longing to dye yarn for ages. I bought a starter pack well over a year ago, that had 4 acid dyes and 2 skeins of BFL. Then I ground to a halt because of the need to keep acid dyes away from anything to do with food preparation. I didn't want to contaminate anything in the kitchen so I put the idea to one side for a long time. Then a few weeks ago I found some interesting videos on YouTube about dyeing in a microwave using food colouring. It looked so easy that I was moved to do some more video watching. So I started off sending my other half to find some white vinegar from the supermarket and I ordered a box of Wilton Icing Colour Gel Pack of 8 and some rubber gloves! When I finally got the gel and vinegar I waited for a day I wasn't feeling awful and got to work. I used a Pyrex jug, but it was a very tight squeeze. This meant the dye settled in the bottom of the jug and saturated into a small part of the yarn. As you can see there is part of the yarn that is very deeply coloured and the rest is very pale. I actually like the appearance but it has made me want to try the next skein in a bigger dish to give me more control over the process. You would be surprised to know that the main colour in the dye I mixed up was violet! I also added some green, blue and black. The colour of this yarn is actually the sort of thing I would buy for myself, so I'm really happy with it, but next time I will put much more violet in and maybe some red. I have decided to wait to dye the other skein until I buy a bigger dish. I have also decided that as I have a big batch of colours and a full bottle of vinegar I need to keep dyeing some more stuff. I thought about buying some more yarn and then decided that what I really need is some fibre to keep practicing spinning with. 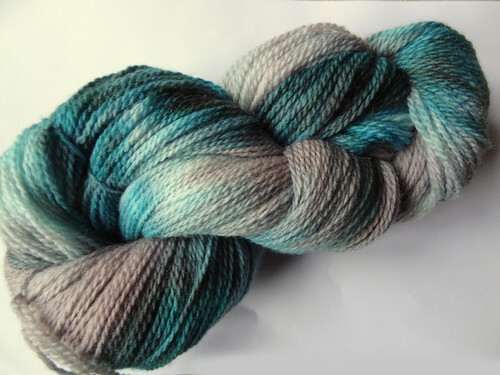 I ordered 500g of superwash merino top from World of Wool to practice both dyeing and spinning on and I don't mind spending £16 including postage for that! I think by the time I finish dyeing that fibre and the other skein of BFL I'll have a better idea of whether I want to carry on learning some more about dyeing or if it will just be an occasional hobby. These are recommendations from the group and I haven't had a look at any of them myself yet, but I thought I'd list the links here so I can find them again and you can look at them if you are interested. I do have a nagging feeling that this could become quite addictive, but it would maybe make me stop buying so much dyed fibre - who I am kidding, nothing will stop me! Speaking of buying stuff, I started a thread on the group to enable us all. If you have a favourite craft vendor that you think other people might like, go and put their details on the thread. Give a link, some details about what they sell and where they are based. Pictures are good too ;-) If you are a vendor you can post too, especially if you have any offers or discounts to share. I'd love to know if you have tried dyeing and how it went from you, and if you have any suggestions for dyeing using non-toxic materials so I can carry on dyeing in the kitchen without worry. Hope you all have a lovely weekend, and don't get too caught up in the gift buying frenzy and have some quiet time for yourself to craft something that makes you happy.